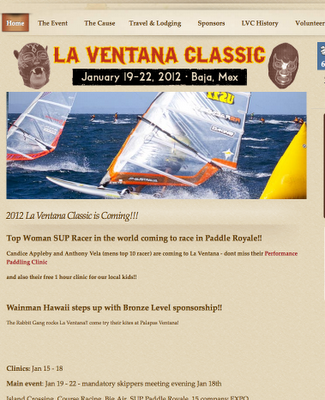 Stand Up Paddle Surfing: La Ventana Classic: Candice Appleby/Anthony Vela scheduled to compete! La Ventana Classic: Candice Appleby/Anthony Vela scheduled to compete! Last year, Tim Hatler's La Ventana Classic pulled in close to 18k dollars for the Southern Baja community of La Ventana/El Sargento. The money (click here for more info on where the money goes) funded projects like extra bathroom facilities for the elementary school, a shade structure for another primary school, air conditioning for the students as well as new infrastructure for the local clinic, trees and paint for a local playground and a foundation for the new police station. This year, Tim's shooting for even more money- hoping to bring improvements to even more parts of this Sea of Cortez fishing community. Here's the website for the Classic- want more information? Click here. If you've got the opportunity and you'd like to race your stand up board in a beautiful setting for a great cause (and get in some kite or windsurfing) you've got to get down there for the Classic! This year the 11 mile Isla Cerralvo to La Ventana Crossing- the main event for the contest- is drawing some serious competitors. There's rumors of a Vela/Appleby two pronged attack- which will undoubtedly present a major problem for the three time crossing champion, Mark Field (aka Kiwi) of Imperial Beach. Click here for specifics about the races. Too much of a skin flint to help out the kids and want everything free, eh? 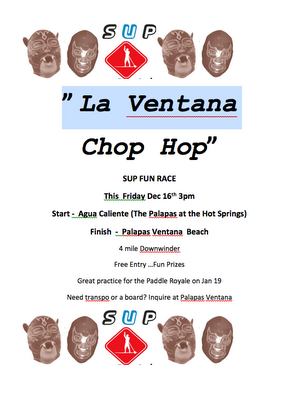 Well get oot and aboot and do this free race... part of the classic... the Chop Hop! Regardless of the level of competion, there's always loads of fun planned for the whole three day event. This year Tim told me he's going to bring back the Lucha Libre wrestlers with an appearance by the small people wrestlers... what??? There will also be reggae bands, high level kiteboarding competitions, food, dance presentations, sunshine, sand... and plenty of cold beer. Sign me up.